It’s still looking like a bit of a birds nest, but I can assure you, It’s safe! 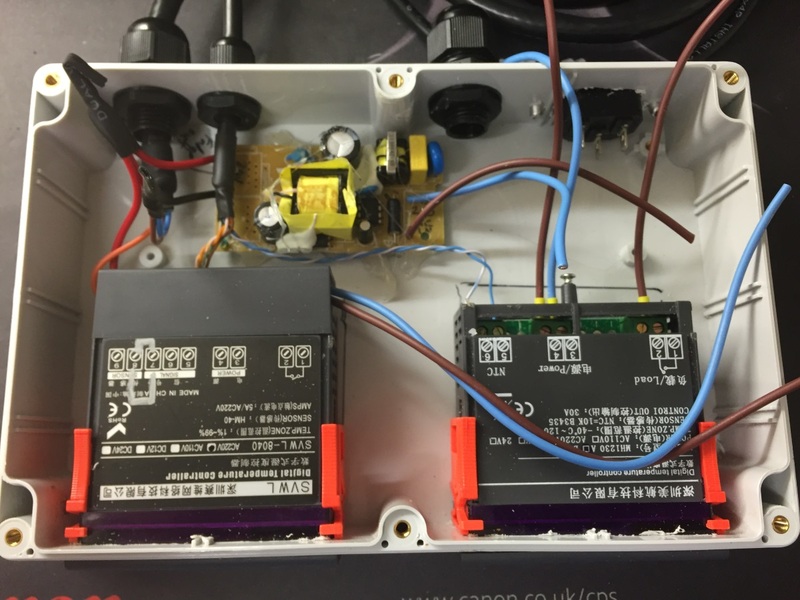 The Temperature and Humidity controllers both run off mains AC power. The PCB at the back is a 24v DC (0.5Amp)power supply. The more diligent readers may notice that the Humidity controller actually says that it’s a “Digital Temperature Contraller[sic]” but I’m confident that’s just a bad translation. 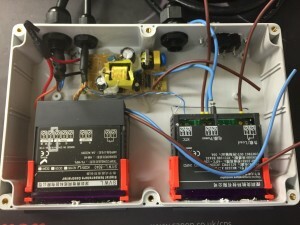 The Temperature controller switches the mains on and off to the fridge to control temperature, while the humidity controller switches 24vDC on and off into the water fogger to add humidity to the system. The fans are wired up to be running permanently. I do not have any heat control – This may be required in cold climates where the ambient temperature drops regularly below 12 degrees (The temperature I plan to keep the fridge running at).